Eversmoke is a good reputable brand of electronic cigarettes and if you never tried e-cigs or personal vaporizers before, EverSmoke disposable e-cigarettes may be a good test to see what vaping is all about. 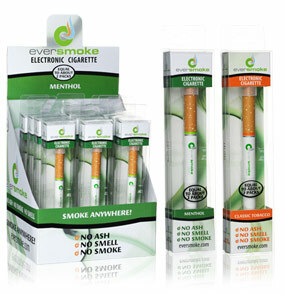 EverSmoke is a leading manufacturer and dealer of electronic cigarettes and offers a wide array of rechargeable and disposable electronic cigarette products to its customers along with wonderful and easy to use starter kits and accessories.They are known for being a quality budget option, for their low prices and decent puff count. The latest addition to its products is the affordable and hassle-free disposable e-cigs. Disposables don’t offer the same options and performance that more expensive rechargeable models do, but they are great for convenience and just trying out the products for the first time. The disposable electronic cigarette offered by EverSmoke keeps the traditional and often replicated look of a real cigarette but features the signature Eversmoke orange glowing tip and is of course, smokeless. It is rated for 500 puffs, the equivalent of almost 2 packs of cigarettes. After testing a few, we can attest that even with long puffs, they probably last for more than 450 puffs, which is very good as many brands don’t do as well as advertised. EverSmoke disposable e-cigs have been designed as 1 piece technology which means that all the components of an e-cig such as battery, cartridge and even the atomizer are present in a single body. Pre-charged out of the box, the single use battery and e-cig can be recycled or disposed of after it dies or empties out. We found the Eversmoke Disposables to be above average. They do not produce the same volume or vapor as the rechargeable models and the flavor is just a tad less strong. But all in all, it’s great for small trips or to test out flavors. EverSmoke disposables are extremely affordable and in fact cheaper than most competitors at this time with a 70% discount. We are not sure how long this deal will keep up but the cost is incredibly low, making it possible for almost everyone to afford a 5 pack and try them out. The 5 Pack is at $14.99 instead of $49.99 – respectively $3.00 per e-cig. 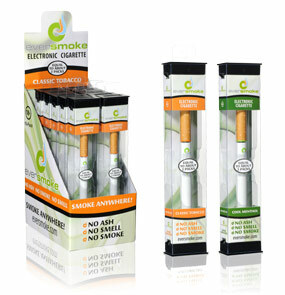 10 Pack marked down at $26.99 instead of $89.99 – respectively $2.70 per e-cig. Also a 15 Pack at $37.49 instead of $124.99 – making it $2.50 per disposable electronic cigarette. Very good deal and if you are looking to save more money, make sure to check out our Eversmoke coupon codes. Just like the Eversmoke Rechargeable electronic cigarettes, the disposable model comes with their popular silicone tip in the mouth piece that basically prevents any kind of flavor leakage and helps the smoker to draw maximum flavor in one draw. They are rated to last 500 puffs, and we can attest that they will last for at least 400, making them a good long lasting disposable, equivalent to more than a single pack of cigarettes or two. 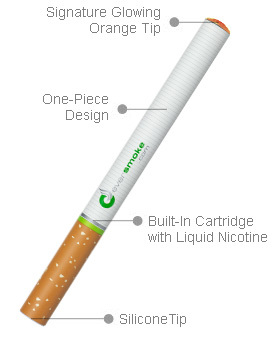 Just like most of its competitive disposable counterparts, the choice in flavor and nicotine amount is very limited. Offered in Eversmoke Classic Tobacco and Menthol, the disposables only come in 1.8% nicotine volume, and we find this to usually be the most difficult part about enjoying disposables. Having the right nicotine level for each individual is very important to the enjoyment and satisfaction of the user. Read our full Eversmoke review here, to learn more about their rechargeable electronic cigarette products and e-liquids.